Anyone interested in a mobile app for this website? Let us know your feedback by participating in this poll on our Facebook page. Just a note that most major group events have been posted to Facebook. Please do take a look and mark down your calendar accordingly. Thanks. Some of you should be noticed this section (previously known as “Uptime”), box in red in the above screenshot, on our Facebook page for a while now. As you may know, our website may occasionally go offline (server hangs, restarts, error serving page, etc…) which are beyond our control. Our website is generally stable and seldom goes offline for extended period of time, but when that happens, it is good to keep you informed as well. Facebook and Twitter can fill in this gap as they are located off-site and they have the budget (and incentive) to keep their website almost 100% online and available to everyone. It is also not possible to us to constantly monitor and update there whenever the website is offline, so we have engaged the service of 3rd party service providers to show the site availability as they check our website at regular intervals. The links to these services can be found on our Facebook page under the “Boxes” tab. So with this, the next time Dragons Online! appears to be offline, you should know where to find out and confirm our site availability! Just a gentle reminder to everyone that the BBQ is this coming Saturday. For more details, please refer to the Facebook event. The Dragon Scout Group Facebook page is finally being fully and officially launch! 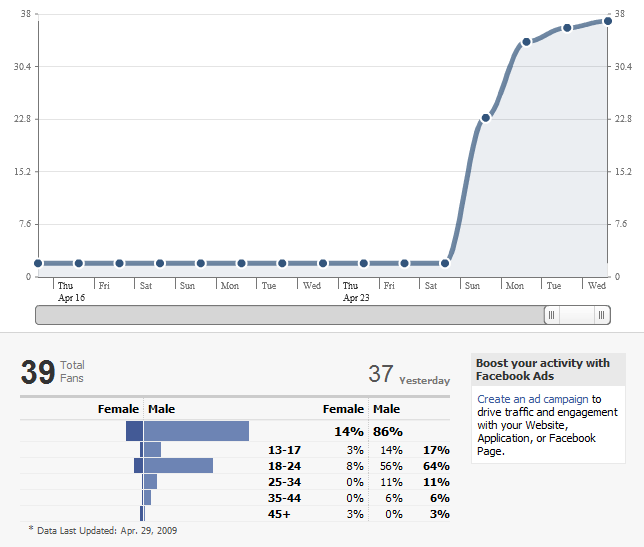 Since the soft launch on 26th April 2009, we have 77 fans and growing (see graph below). We hope more old, present & future, boys & girls of the Group will join our Facebook to keep in touch and be kept updated of our activities. We are currently organising a BBQ for all Rovers, Leaders & Chapters (old boys and girls) via Facebook and it looks very promising for our first event on Facebook. Please join us and continue to support our website! It has been about a week (5 days to be exact) since the Facebook soft launch was announced. Response have been quite positive so far, but I believe we could do better. What are you waiting for? Get everyone to join now! 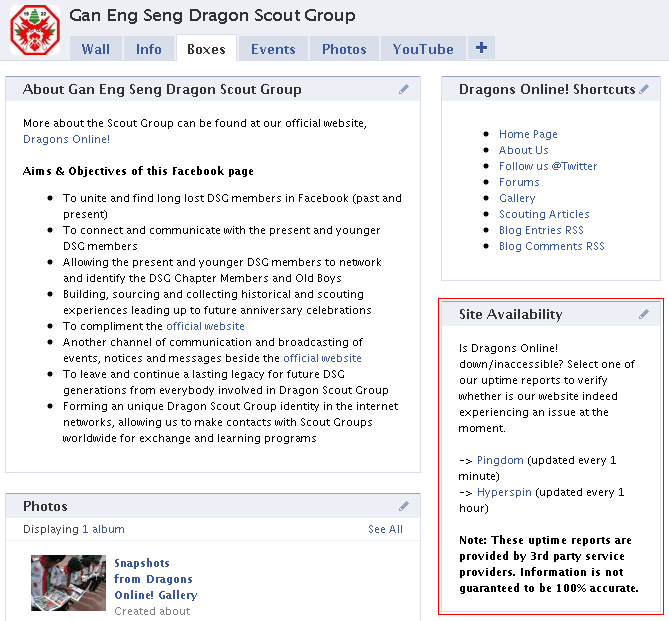 Remember that you participation will determine whether if the Dragon Scout Facebook page should stay or not. In an effort to make Dragons Online! more social networking friendly, we have created a page at Facebook. As this is still an experiment and we are testing the features to integrate Facebook into Dragons Online! and yet not over-shadow it, I am doing a soft launch first. Until we are comfortable with what we can achieve with Facebook, only then will we fully launch it and display the links all over the website. Please add yourself as fans to join us in Facebook.